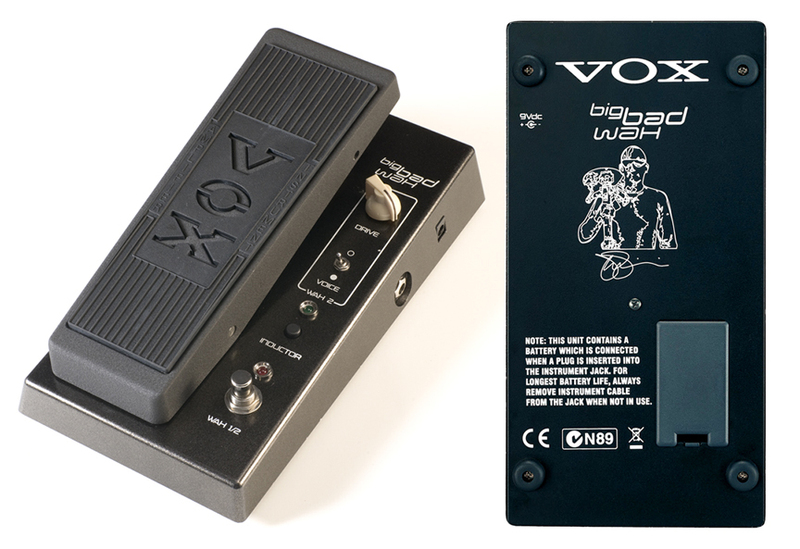 The Vox JSWH Big Bad Wah integrated two inductors and two completely unique and footswitchable wah circuits, Wah 1 and Wah 2, into one pedal. At the heart of all prior Vox wah circuits was a 500mH inductor. This inductor is part of a tuned circuit that boosts the frequency set by pedal position. While wah pedals normally have one inductor, the Big Bad Wah offered the choice between two, as shown below. 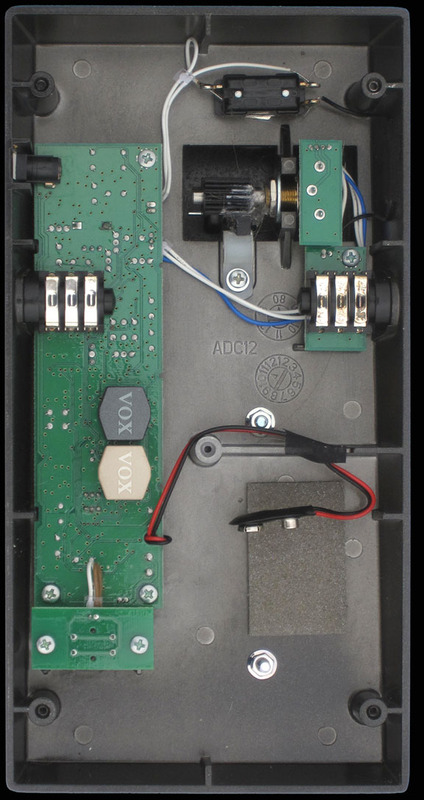 Vox indicated that the black inductor was voiced to sound like a classic UK Vox wah pedal while the tan inductor simulated the tone of a modern US wah. The schematic for the Big Bad Wah indicated that the black inductor was 560mH and the tan inductor 620 mH. Just like a standard Vox wah, one applies pressure to the top of the pedal rocker of the Big Bad Wah to go from "signal bypass" to "effect on." A foot switch labeled "Wah 1/2" toggled between the wah circuits. Vox described Wah 1 as having the classic wah-wah sound while Wah 2 was the "hot-rodded" version. The Wah 2 circuit introduced the "Voice" and "Drive" controls. The two position Voice switch selected between a "bright" or a "dark" tonal sweep. The rotary Drive control offered up to a 10db boost in gain. A red LED lamp indicated that the Wah 2 circuit was selected. The "Inductor" button toggled between the black and tan inductors, globally applying the chosen inductor to both Wah 1 and Wah 2. A green LED "Inductor" indicator lamp signaled that the tan 620mH "US style" inductor was selected. Unlike the original Vox Wah-Wah pedal, the Big Bad Wah incorporated a true signal bypass. This means that when the wah circuit is not in use, the signal passes from input to output jacks without connection to any component of the wah circuitry. My thanks to Music-Go-Round in Greenfield WI for allowing the Vox Showroom to take photos of this JSWH Big Bad Wah.